HOUSTON (AP) The Houston Rockets allowed Philadelphia 76ers point guard Ben Simmons to take jump shots on Monday night and he made them pay. In Philadelphia’s 115-107 win in Houston, Simmons made 10 of 15 shots, many of them from mid-range, to score a career-high 24 points, adding nine assists and seven rebounds. When asked why he took more jumpers than he had in his first six games, Simmons’ teammate Amir Johnson answered from behind the group of reporters. Philadelphia head coach Brett Brown said Simmons’ ability to reliably make jump shots will complement his ability to drive or use his length in the paint even more effective. Simmons, the 2016 first-overall pick, is shooting 51 percent through his first seven games but has struggled at times outside of the paint and has missed all four 3-point attempts. Brown credited his team’s defense, particularly on the perimeter, down the stretch for getting late stops against Houston. James Harden scored 29 points and Gordon had 25. The Rockets shot just 39.8 percent from the floor. Last season, they were 1-7 when shooting below 40 percent. 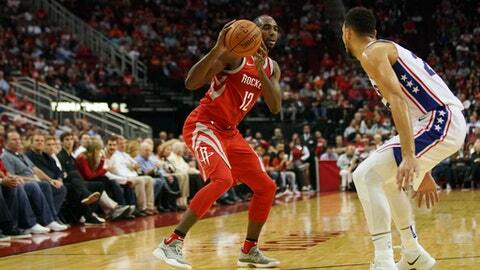 Harden called the team’s energy ”terrible, terrible,” and said the defense allowed too many easy points in the first and third quarters. The 76ers led 58-56 at halftime. 76ers: SG JJ Redick missed his third straight game with lower back tightness. … PG Markelle Fultz (shoulder) missed his fourth straight game. Fultz is out indefinitely and will be reevaluated in three weeks, the 76ers said Sunday. Rockets: Nene entered the game questionable with left Achilles soreness but played 10 minutes in the game, getting seven points, three rebounds and a block off the bench. … After shooting 17-for-35 (48.5 percent) in a three-game road trip, PF Ryan Anderson shot 2-for-9 from beyond the arc. The 76ers arrived in Houston a day early on Sunday to attend Game 5 of the MLB World Series at Minute Maid Park in downtown Houston, blocks away from the Toyota Center. The players represented both the Dodgers and Astros with a mix of customized jerseys with their names and numbers on the back. Houston-native rapper Slim Thug was the celebrity guest shooter for Houston’s new ”First Shot,” promotion. The 6-foot-6 rapper swished his free throw before tipoff, ensuring a $5,000 donation from the Rockets to charity. His shot followed banked shots off the glass from both Texans WR DeAndre Hopkins and Blue October lead singer Justin Furstenfeld in the first two games. Joel Embiid had 22 points, nine rebounds and five assists with two steals in 25 minutes. Dating back to 1983-84, it is just the third time a player has posted those numbers in 25 minutes of play or less. Pau Gasol did it in 2015 for Chicago and Fat Lever did it in 1990 for Denver. 76ers: Host the Hawks on Wednesday night. Rockets: Visit the Knicks on Wednesday night.